The present study involved comparative study of effect of various polymer combinations on topical gel of Syzygium Cumini & their antimicrobial activities since combinations of polymers enhances the bioavailability, permeation and drug delivery. Results of study revealed a stable, elegant formulation of Syzygium Cumini gel. The best polymer combination was found to be mixture of Carbapol and HPMC which showed excellent rheological & texture properties. The study showed that all formulations possess value of quality parameters within range. Study also described significance of various polymers in characteristics properties of gel such as rheological properties. The formulation G3 showed better antimicrobial properties as compared to others formulation. KEYWORDS: Syzygium Cumini, polymers combination, Carbapol, HPMC. Recent review of scientific literatures revealed that researcher play great attention towards the release of drug from conventional topical dosage forms such as lotions, creams, ointments and powder. The enhancement of bioavailability has now become the major area of investigation. Creams and Lotions often provide poor bioavailability of the drug because they are rapidly cleared from the skin and poorly release the drug from base. Gels are semisolid dosage topical dosage form in which the movement of the dispersion medium is restricted by the network of particles. There are various polymers can be use for the preparation of semisolid formulation; these polymers individually as well as in combinations improve drug release profile significantly. Sodium alginate, Carbapol and HPMC are few available options of polymer which have been utilized extensively in recent years. The use of gel as a delivery system can increase the residence time of drugs on the skin and consequently enhance bioavailability. Gel may possess various advantages over other system of drug delivery; such as ease of administration, non greasy, patient compliance, high residence time on the skin and better drug release [1-3]. Syzygium cumini belongs from the genus Syzygium and family Myrtaceae which is native to the tropical region. Plant has been reported to possess antimicrobial activity. Syzygium cumini is commonly known as black plum. The other synonyms are Syzygium jambolanum and Eugenia jambolana. The plant leaves are known to possess antidysenteric action and seeds are believed to possess hypoglycemic & antimicrobial action. Bark of plant anciently known to have Vibrioicidal and antifungal activity [4-7]. Plant materials were collected locally and other ingredients used were of analytical grade. Double distilled water was used throughout the study. Herbal materials were subjected to methanolic extraction using a soxhlet extractor after grinding. Concentrated extracts were then used for formulation of topical preparations. The gel formulations were prepared by using the compositions as mentioned in Table 1. Carbapol was allowed to soak in purified water containing sodium benzoate. HPMC/Sodium Alginate solution was prepared & homogenized at 3000rpm in homogenizer. Then drug solution was prepared in Ethanol and Propylene Glycol was transferred in HPMC/Sodium Alginate solution and homogenized. Then Polymer drug solution was transferred in Carbapol solution & neutralized it with triethanolamine followed by homogenization. The gels were evaluated for pH, viscosity, spreadability and microbial evaluation. pH of the formulations were determined using digital pH meter. Brookfield Viscometer was used to determine viscosity. The instrument measures shearing stress on a spindle rotating at a definite, constant speed while immersed in the sample. Cup-Plate method was used to perform antimicrobial evaluation of gel formulations. The bacterial strains used in the study were both gram positive and gram negative bacteria such as Escherichia coli and gram positive organism Staphylococcus aureus. Antifungal activity was performed using fungal strains such as Candida albicans and Aspergillus niger. The plates for antibacterial test were incubated at 37°C for 24 hours while plates for antifungal tests were incubated at 37°C for 48 hours and their zones of inhibition were measured. The different gel formulations of Syzygium Cumini were prepared using various drug: polymer ratio and combinations as mentioned in Table 1. The ratio of polymer modified to assist the effect of polymer combination on formulation profile. Sodium alginate, Carbapol and HPMC were used as polymer for the gel preparation. The various quality control parameters also performed along with antimicrobial evaluation. The results of quality parameters revealed that formulations G1 and G3 possess desire quality parameters as mentioned in Table 2. Formulation G1 showed better homogeneity & spreadability than others. All the formulations showed pH within range from 6.5-7.2. The rheological behavior of all gel formulations was also investigated and G1 was found to possess optimum viscosity as gel formulation. 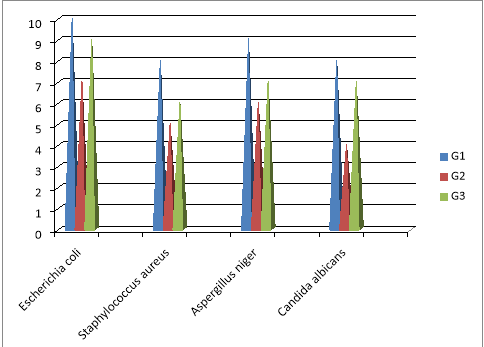 The result of antimicrobial study revealed that formulation G1 exhibited greater inhibition against selected microbial strains as described in Figure 1. The greater zone of inhibition of gel formulation G1 may be attributed to the fact that this polymer ratio release drug in better way as compared to the other formulation. The results of study suggested that amount of HPMC affect gel base properties greatly. Formulation G1 possesses optimum gel properties and thus provides better drug diffusion profile which may contribute towards the topical antimicrobial activity. Study also concluded that herbal gel prepared from combination of synthetic & semi synthetic polymers possess shear, stickiness and adhesion which are essential features of topical formulation. The study suggested that this drug: polymer (G1) can be utilized for the preparation of topical herbal gel as antimicrobial agent. Dan Ester Quinones, Formulation & Characterization of Nystatin Gel, PRHSJ, 2008; 27(1): 1. Nikujana A. Patel, Formulation & Evaluation of Curcumin Gel for Topical Application, Pharmaceutical Development & Technology, 2009; 14: 80-89. Sinha VR, Permeation Enhancers for Transdermal Drug Delivery, Drug Development and Industrial Pharmacy, 2009; 26(11): 1131–1140. Kothari V, Seshadri S, Mehta, P, Fractionation of Antibacterial Extracts of Syzygium cumini (Myrtaceae) Seeds. Biotechnol. Res., 2011; 2(6): 53-63. M Amareswarareddy, B. Kameswararao. S, Antibacterial Activity of Syzygium cumini in Herbal Tooth Paste Geethika Priscilla, Int. J. Inv. Pharm. Sci., 2014; 2(3): 724-729. Sagrawat H, Mann AS, Kharya MD. Pharmacological Potential of Eugenia jambolana: A Review. Pharmacogn Mag. 2006; 2: 96–104. Chandrasekaran M, Venkatesalu V. Antibacterial and Antifungal Activity of Syzygium jambolanum Seeds. J. Ethnopharmacol. 2004; 91: 105–108. Multimer MN, Riffskin C, Hill JA. J Am Rheological and Mechanical Properties of Pharmaceutical Gels. Medicated Systems-Relevance to Hydration Properties and Drug Release. Boll. Chim. Farm. 2001; 140 (5): 337 -44. "Effect of Polymer Combinations on Syzygium Cumini." UKEssays.com. 11 2018. All Answers Ltd. 04 2019 <https://www.ukessays.com/essays/biology/effect-polymer-combinations-syzygium-5204.php?vref=1>. "Effect of Polymer Combinations on Syzygium Cumini." All Answers Ltd. ukessays.com, November 2018. Web. 26 April 2019. <https://www.ukessays.com/essays/biology/effect-polymer-combinations-syzygium-5204.php?vref=1>. UKEssays. November 2018. Effect of Polymer Combinations on Syzygium Cumini. [online]. Available from: https://www.ukessays.com/essays/biology/effect-polymer-combinations-syzygium-5204.php?vref=1 [Accessed 26 April 2019]. UKEssays. Effect of Polymer Combinations on Syzygium Cumini [Internet]. November 2018. [Accessed 26 April 2019]; Available from: https://www.ukessays.com/essays/biology/effect-polymer-combinations-syzygium-5204.php?vref=1.